I Get It : Finally! I’m really good at keeping busy. I like helping out and doing things for others. But this year I’ve really noticed that without even realizing it, I was still putting myself last. I’ve been “single” for years. But most of that time, I was actively dating or looking for ways to meet someone. Wishing. Praying. I was fine doing things alone– going to dinner, the movies, staying home and enjoying it. And I kept so busy. I was singing in the choir at my parish. I was attending political fundraisers and meetings, phone-banking, canvassing. My Sunday mornings were for Mass. I was always there for my friends. But the best friend I’ll have is myself. Why am I so quick to change my plans for others? Slowly this year, I’ve been clearing my schedule of those obligations. Even Mass. I’ll go when I feel like it, but am not allowing myself to feel guilty if I don’t. Instead, I’m going to run as much as I’m able. That’s my priority. I’ll meet God outside, and worship him in motion. Like any adult, I know how to push myself. Through fear, confusion, sickness, exhaustion. But have I ever truly set an ambitious goal and believed? All I saw were obstacles. I won’t say they were excuses– I was terrified to fail. So I would just not even attempt it. And sometimes depression crept in, manifested in over-sleeping. But running is a natural anti-depressant. Endorphins are real! My initial reaction is one of caution. I get that from my Dad. He’s wonderful, but he’s not the best at encouraging me when I want to try something new. And it’s understandable. He’s suffered a lot of loss. I’ve battled health problems all my life. But I’m changing. I’m realizing that’s just the way he’s built emotionally- and it makes sense for him. And that I don’t need his approval to motivate me. I was in this mind-frame of asking for permission. But now I’m giving that permission to myself! I don’t need to even tell him. I can just do it. I can do what makes sense for me, even if he doesn’t get it. My dreams are bigger than his: and that’s okay. A friend at work approached me about a race yesterday. He knows I run… sporadically. This friend is a consistent runner– even in the winter! He has a training regimen. Months ago, I had approached a different friend about running this race with me. She wasn’t game– I just gave up on it. I’m going to sign up for it: the Solider Field 10 Mile in Chicago on May 27. So what if I don’t finish it? I can still do my best. And I’ve finished every race I’ve run thus far. Instead of sleeping in on weekends, I want to go bed earlier. I want to rise and run. I usually like to sleep in on weekends. But if I had a date or some fun plans, I’d get up. What if my fun plans were running?! And now I get it! The true FREEDOM of being single: constructing my life 100% around ME. Without obligation or guilt. I will never have that kind of freedom again later in life. Just what I want to do. It’s not selfish. It’s necessary. Even with casual dating, you have to block out time for this person. You talk to them after work, they may text you to check in during the day. You plan dates– you invest hours and days and weekends getting to know each other. In taking this time for myself without dating on the table, I’m putting ME first. I’m saying that the biggest priority is what *I* want to accomplish. I won’t let myself feel guilty about saying “no” to social invitations. Or going home early. I can still make sleep the priority– by regulating a bedtime and schedule. I’ll build socializing into running. I’ve got three months to train. I have no idea how, but that’s the adventure. And I’ve got running friends to support me. I was hoping this year to bring someone to my church for Midnight Mass. I wanted to share it, especially since it was my first TRUE Midnight Mass. Other years and other parishes, it started at 10:30 or 11:30– not the same. And this was my first time celebrating as a choir member. Our rehearsal on Wednesday was a full two hours, and WOW was it fun!! We sang a record NINE songs in 1.5 hours, though not each in entirety. I realized how deeply embedded these songs are within me, as I didn’t need to read the lyrics to most of them. They are just part of growing up Catholic or Christian. Yesterday at work I prepared myself with a Venti Peppermint Mocha. I needed to stay awake. It worked! Our service was truly unlike any other I’ve attended. We began with a male member, Jim, singing a solo to “Joseph’s Lullabye,” while a younger member performed a beautiful dance to it. Then the choir entered from the wings on either side, holding candles. The lights were turned off. Slowly we proceeded in to “Silent Night,” one of my favorites. And I loved the symbolism– of Jesus’s birth. Jesus, the Light of the World, coming into our midst. I was happy to hold a candle, to directly participate in illustrating the love of God for humanity, that He sent his son to live among us, to indeed become human. I felt a deep kinship with my fellow choir members. I recognized faces from the pews on Sunday– even though they had a small child or are older themselves. Many would choose an earlier Mass. There was another service option– this morning, Christmas Day. But everyone I wanted to see was there. It was community. And my wish was granted by my dear friend, Dulcinea. She came to see me and support me. She took pictures as I filed in. She photographed our performance, and best of all, got it on video! Watching it, I saw reflected what I love about our choir. Rather than stoic and militant, we were alive with movement, joy, and familiarity. We swayed, clapped, and looked at each other smiling. We cheered on our soloists! It was special. This choir has given me something vital. A deep sense of belonging. A direct and FUN way to serve my parish while rejoicings simultaneously. A new group of friends who share my religion and values. One day, it’ll be me soloing! Dear Lord, what a blessing!! I feel cherished. I feel grateful. I feel loved. 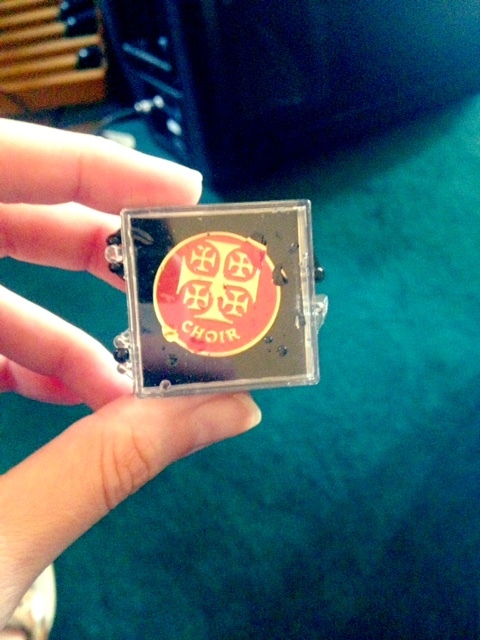 Yesterday at Mass, the choir were given pins by Father Ray. This is my second– the first said “Minister of Care,” when I was bringing Holy Communion to a family. Now I’m serving our parish in the choir instead. When I saw Father holding them, I went over to claim mine. He pulled his hands back. A few minutes later, he blessed them all with Holy Water. They were all the more special for that. I had to take a picture– you can see the Holy Water droplets on the plastic case holding it inside. Reminds me of fourth grade, when my class were given a Bible. They were blessed with Holy Water. I still have mine. Though I admit I don’t read it often. This little gesture from Father Ray to our choir made me feel so included, part of something special. I had someone take a picture of me wearing mine on my shirt. It’s gleaming there– my smile is huge! I love our white and red choir robes! He asked us to wear our pins with pride each Sunday. This was a great week for me– I gotta tell you! Yesterday morning on the way to work I was listening to Christian radio and heard the perfect song– “Soul on Fire,” by Third Day. Even better, the lyrics talk about RUNNING! I felt like God was telling me, “Keep it up, kiddo!” That’s the song I’ll be thinking of as I run. It was a bit chilly tonight but I put on a stocking cap and a hoodie and I was good to go. I took two days off running this week, Thursday and Saturday, to give my feet a break. Eleise and I kept to our schedule of three runs, and tonight I did .96 by myself without stopping! I checked my phone at the end of the block and then kept going till I hit 1 mile! And then I walked a bit, and ran to finish my goal of 1.75 miles– I made it 1.81 by the time I got home. I’m getting mindful of what I’m eating, as well. I had a good lunch with my Dad today after Mass, and later tonight I passed on cheesecake and coffee. Wednesday night was our choir’s last rehearsal of the summer! I had such a good time and will miss them for the next few months! Our choir director, David, ran threw several songs so that I could get up to speed and they could review. Rehearsals are laid-back and equal parts fun and music education. The best part of our rehearsals is always at the end, when we stand in a circle, hold hands, and pray for whomever we feel called to with our intentions, be it out loud or just in our hearts. I specifically asked if we could get all of us together after Mass today and take a few quick pictures of us looking all spiffy in our choir robes! This is also the last week we’re wearing them– they’ll be taken to get cleaned and we’ll resume them when it cools off. Although I’ll miss the pride of wearing one, I do admit it’ll be a nice reprieve in the coming heat! The whole choir (those I’ve met, some are currently not singing right now) wasn’t quite there today, but we got most of the group who have regularly been at rehearsals since I joined. I asked a tall gentleman to take pictures of us and he did! He was kind enough to take several, and I found two I really liked. We are diverse, happy, and coming together to share our joy in the Lord! I was so proud to post it today on Facebook. And as for the sushi, I declared last night Date Night for myself and my book and went out for sushi! Why not? I got a lot done this week! I wanted to celebrate. I put on a cute outfit, a bit of perfume, and brought a book with me. Between the meal and the words, I had a great time. Today is just one of those days that I feel grateful, motivated, and healthy. 1. My parents volunteered to come visit my parish for the first time! 2. I got to sing in the choir again!! 3. Instead of our robes today, we choir women dressed up and wore hats! 4. My friend Dulcinea also went, and I saw her taking pictures as we sang. She also wore a hat! 5. We actually sang “Gloria Festiva,” this time– and I rocked it! 6. I danced a bit during our songs. Why not?! 7. Listening to the organ, piano, bass guitar and drums, I could NOT stop smiling. Mass is just better with some real music. It’s traditional and yet contemporary. 8. My parish greets each new member by asking them to stand up and say hello and where they’re from. Diane said they were my parents and they came to see me– the person in the choir with the biggest hat! (I did!) That got a laugh from everyone and I felt so spoiled. 9. I followed along with all the songs better today– I’m getting the hang of it! 10. After Mass, I took my first picture with some of the other choir ladies. They were all wearing bright, wonderful suits and hats that defy gravity and reek of style. — Addendum: As we left, each woman was given a special gift. Along with the Mass bulletins, there were bookmarks in a stack for the taking. They are purple and rectangular. On the front it says, “10 Reasons I’m a Woman of God,” and on the back, it lists them. I love that our parish is small enough that we get these little extra gifts. Each woman was also handed a carnation upon leaving.